You can live a life without stress, anxiety, worry and fear. The Reduce Stress, Release Weight 5-Week Online Course will show you how to master your emotions and release unwanted pounds to create a more fulfilling life. Getting comfortable in the stillness and silence of your thoughts is where you'll discover peace and clarity. This course can show you how to take your life and health to the next level. You’ll not only decrease the amount of stress and unease in your life, but you’ll find a sense of purpose and fulfillment. You’ll strengthen your awareness and connection with the Universe to create a life of joy and self-actualization. As a result, your body will release unwanted weight you've previously held onto. Hi! 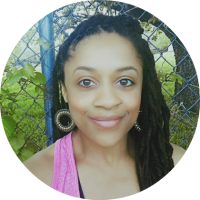 I'm Imani Sankofa, Holistic Health Coach. As a result of working with us, women learn to reduce stress, release weight, and reconnect to life. We are looking to work with women who are interested in peace of mind, improved health, and creating a life they love. Our mission is to help women experience the freedom of a stress-free mind so they can live life to the fullest.